The Belfast City Deal, the first such deal in Northern Ireland, has moved a step forward after the NI secretary approved its heads of terms. Karen Bradley signed the terms - an outline business case - alongside the Belfast City Regional Deal partners and the NI Civil Service on Tuesday. The government described the agreement as "a major milestone towards the completion" of the deal. 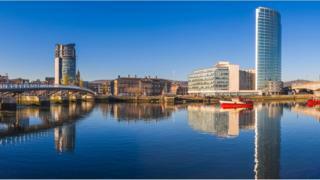 It proposes to invest £350m into the Belfast region over the next 15 years. The government said it was envisaged that this money would be matched by the Northern Ireland Executive - if devolved government was restored. "The city deal will be further bolstered by co-investment of upwards of £150m from Belfast Region City Deal partners and investment by the private sector is anticipated to bring the total investment package to over £1bn," a statement by the Northern Ireland Office said. Ms Bradley said she was "absolutely delighted" to sign the agreement for the funding aimed at supporting and encouraging economic development. "I am also engaging closely with the chancellor to secure a financial announcement for the Derry-Londonderry Region City Deal and help unlock the huge potential that Derry-Londonderry has to offer," she said. "It is hoped the deal will see the delivery of more than 20 projects to help create up to 20,000 new and better jobs alongside an increase in productivity levels, as well as having a positive impact on the most deprived communities, delivering a balanced spread of benefits across the region." Belfast City Council lobbied for the deal in partnership with six other councils: Antrim and Newtownabbey; Ards and North Down; Lisburn and Castlereagh; Mid and East Antrim; and Newry, Mourne and Down. Belfast Lord Mayor Deirdre Hargey said the signing was a "significant milestone" and a "testament to the power of collaboration and partnership". DUP deputy leader Nigel Dodds said the deal "will make a real difference to people right across the six council areas which have worked together on the proposal". SDLP deputy leader Nichola Mallon said: "This city deal will go a long way to creating jobs and changing our region's economic fortunes. "The SDLP will continue to push for a city deal for Derry, to ensure communities in the north west are treated fairly. Northern Ireland can only truly prosper if all parts of it are enabled to prosper," she added. Ulster Unionist MLA Andy Allen said that the development was "great news for Belfast and indeed for Northern Ireland as a whole". Retail NI Chief Executive Glyn Roberts said that it hopes it "will be a game changer for our local economy and for vital regeneration projects in the Belfast Region area". What is a city deal? Northern Ireland will be the last remaining part of the UK to get a city deal - there are already more than 30 across Britain. First used in 2012, they are designed to give more spending and decision-making power to local authorities. An Islamist preacher said to have planned Sunday's bombings died in one of the attacks, Sri Lanka's president says.